The trek begins from Sundarijal, a Himalayan river-fed water reservoir and climbs onto the Shivapuri ridge offering gorgeous views of Gauri Shanker (7134m), Lantang Lirung (7246m) and Ganesh Himal (7405m). Following a ridge line the trail passes through Kutumsang (2460 m), the first permanently inhabited village of this trek and climbs through rhododendron forests to Tharepati (3510 m), the highest point of the trek. The gompa that we come across at Tarke Ghyangcommands excellent views of Dorje Lakpa (6996 m) and Ganja La to the north. 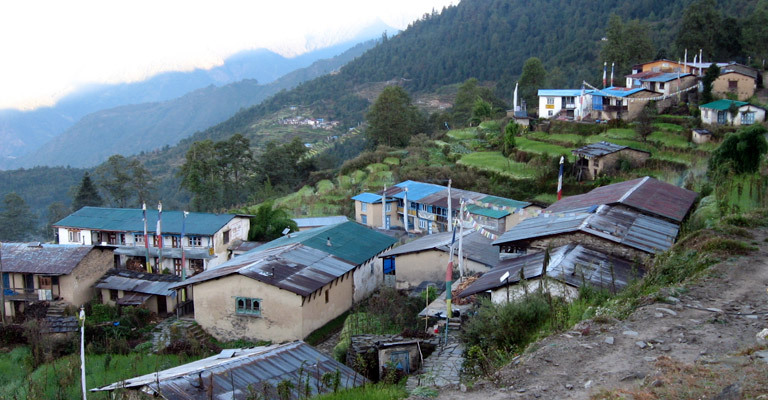 Day 03: Kathmandu - Sundarijal - Chisapani (2215m) 01:00 hrs drive and trek to 04:00hrs. Day 04: Chisapani - Kutumsang (2470m) 06:00hrs. Day 05: Kutumsang - Tharepati (3510m) 05:00hrs. Day 06: Tharepati - Tarkeghyang (2740m) 07:00hrs. Day 07: Tarkeghayang - Shermanthang (2590m) 05:00hrs. Day 08: Shermanthang - Melamchi Bazaar (870m) 06:00hrs. Day 09: Melamchi Bazaar - Kathmandu (1310m) 05:00hrs drive. Day 10: Departure transfer to onward destination. We now descent from the ridge through the villages, and forest. Explore Melamchi Bazaar. Arrive Melamchi Pul Bazaar at the bank of the Indrawati river and 4 hour drive to Kathmandu. Entrance fees & Trekking permit (TIMS).